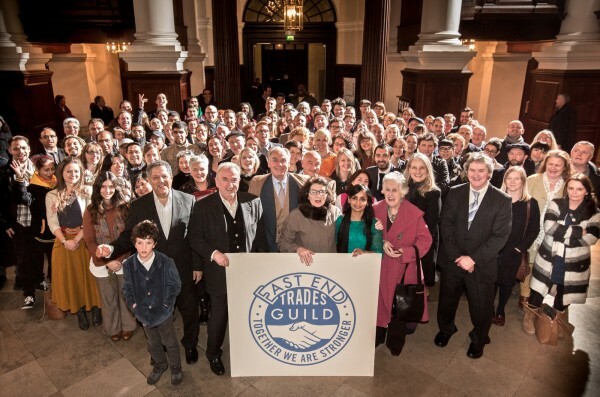 Since the launch of the East End Trades Guild last November, members have been busy behind the scenes forming an interim board and creating a legal constitution. Yet in parallel to this process of securing the foundations that will enable the Guild to speak as the authoritative voice for all proprietor-owned-and-run-businesses in the East End, there have been some notable successes which culminated in a meeting at Westminster this week. A survey of the two hundred East End Trades Guild members by the New Economics Foundation revealed that collectively they represent a turnover of £77 million and employ twelve hundred people, of which almost all live locally. Additionally, Guild members contribute £17 million in wages to the local economy and pay £1.3 million in business rates. These figures contradict the assumption that small businesses are less significant financially than larger businesses, when in Tower Hamlets small businesses are the greater part of the economy. And it was not long before local government, in the form of Lutfur Rahman, Mayor of Tower Hamlets, recognised the political significance of the Guild, and requested to come and meet the members, visiting some of their businesses in February to hear members’ concerns directly. 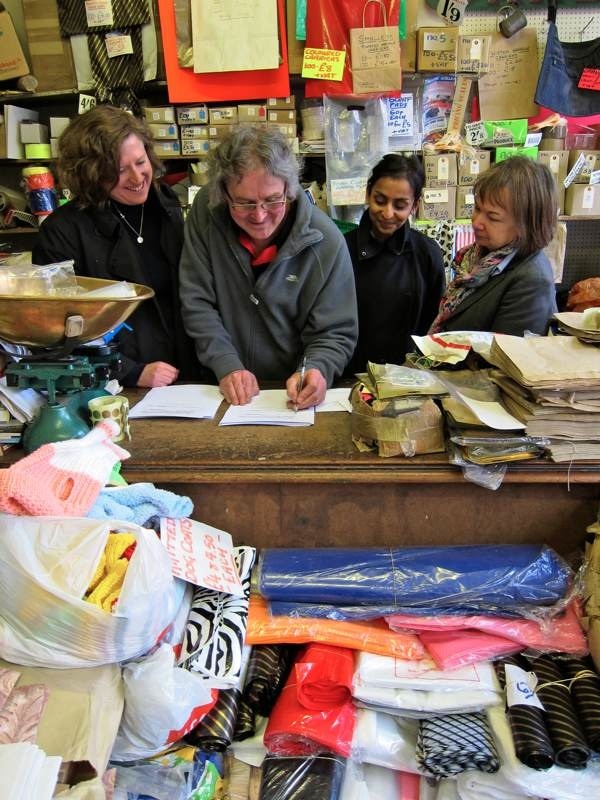 The first tangible indication of the power of the East End Trades Guild came early in the year when shopkeepers in Whitechapel, including London Trimmings and M & G Hardware based in the Cambridge Heath Rd, were able to bargain collectively through the Guild to win compensation from Crossrail for loss of trade during the extended building works for the new rail link. 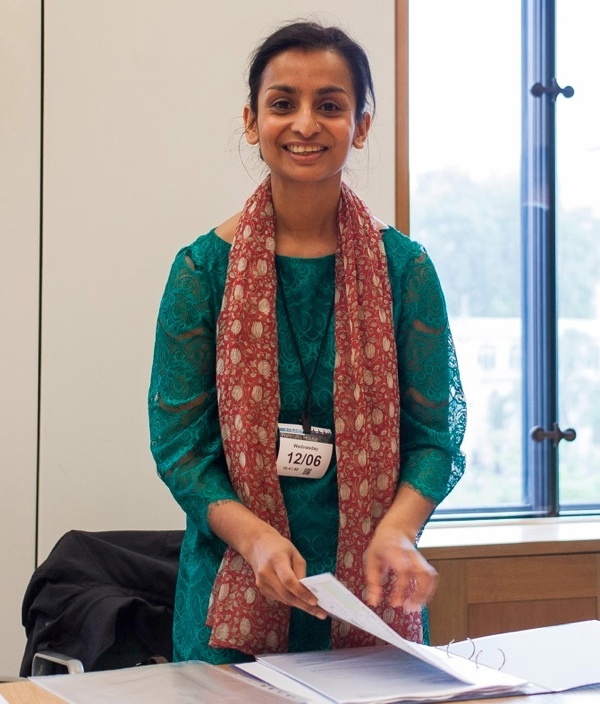 As an outcome of this debacle, the reluctance of Balllymore to negotiate or have dialogue with small businesses was addressed this week with a meeting in Westminster hosted by Rushanara Ali, MP for Bethnal Green & Bow. Members of the East End Trades Guild led by Shanaz Khan, Acting Chair, met John Turner, Ballymore’s Head of Planning and Gareth Keating, Ballymore’s Director of Asset Management, across a table in Portcullis House on Wednesday. Although Ballymore have now sold the Spitalfields Market for £105 million, to set against their £800 million debt, they remain heavily involved in the vast new developments proposed for the site of the former Bishopsgate Goods Yard and it was this which formed the substance of the debate. While Ballymore made a profit on the sale of the Spitalfields Market based upon the increase in property value, their policy of leasing the shops to chains and their corporate management of the stallholders has reduced the footfall in recent years and sucked the life out of the market, with the notable exception of Thursday’s antiques market. Challenging this shortcoming, Shanaz Khan, on behalf of the Guild, advocated the value of small independent businesses, not least as the primary reason why people come to the East End. She requested that Ballymore enter into a dialogue with the Guild about the Bishopsgate Goodsyard developments – something that could be beneficial to both parties, permitting Ballymore the opportunity to work in partnership with local businesses and creating the possibility that the new developments could have an integral relationship with the existing markets and small trades, and not simply introduce shopping malls filled with more chains into the East End. John Turner referred the Guild to Ballymore’s existing “community consultation” and invited them to take part in that. But when a Guild member pointed out that they had attended the consultation meeting for local businesses and no-one else had turned up, it became apparent that there was a widespread public mistrust of Ballymore, and the sincerity of their consultation process was questioned. “It’s going to be different this time,” claimed John Turner, advocating the merits of his expensively-conceived community-style consultation. “That’s what you said last time,” retorted Rushanara Ali in frustration, “Ballymore has created a lot of bad feeling and unhappiness in Tower Hamlets.” Chastened and recognising that they were not going to be let off the hook, Ballymore agreed to regular direct meetings with the East End Trades Guild with the date of first meeting set in July. 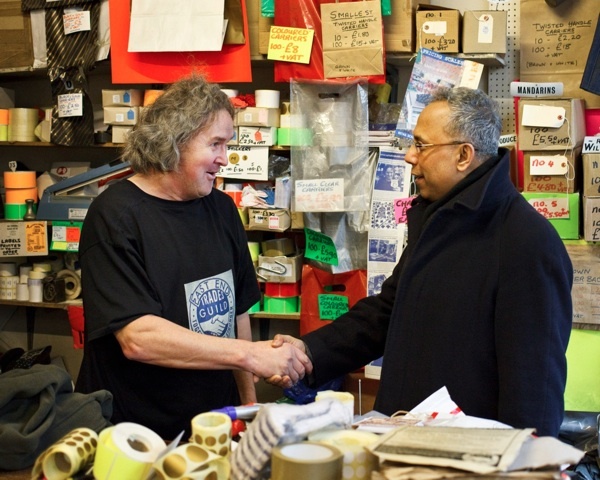 Elected Mayor of Tower Hamlets, Lutfur Rahman, congratulates Paul Gardner of Gardners’ Market Sundriesmen on founding the East End Trades Guild. At Westminster, members of the Guild with Shanaz Khan, Acting Chair, shaking hands with John Turner of Ballymore, in the presence of Rushanara Ali, MP for Bethnal Green & Bow, initiating a new dialogue between local traders and large-scale developers. Shanaz Khan, Acting Chair of East End Trades Guild and proprietor of Chaat Tea House in Redchurch St. The Founding of the East End Trades Guild at Christ Church, Spitalfields, last November. On the money! Fantastically encouraging… and so interesting to see the actual figures on just how much small independents contribute to the East End economy. Thank you for sharing. What a wonderful example of people power. It just goes to show what can be achieved by sticking together. East End Trades Guild, I applaud you for taking on the ‘big guns’. Marvellous! Congratulations on your efforts at bringing pressure to bear on organisations like Ballymore; they should know that through your writings, the world is watching! What remarkable achievements already! Congratulations! Congratulations to the East End Trades Guild!!!! and congratulations to you gentle author for your part in drawing attention to all these matters affecting the character of the borough and individuals struggling against the odds. Delighted to read this heartening and interesting post. All strength to the East End Trades Guild. Developers expect to deal with residents associations, with NIMBY campaigners, with the planners. A jolt to have to deal in this way with the independent business community coming together like this, making it harder to neutralise objections. Long may this Guild hang together for mutual and community ‘self’interest’. i am so proud of your role in helping put this together. from having dealt with developers and their charette system previously, i can only tell you to take your lawyer and two or three well-charged video cameras to those community meetings. Congratulations and much luck to you all.